Franklin, Louisiana Mayor Raymond Harris, Jr. accepting the award for “21st Century Water Meters” program. 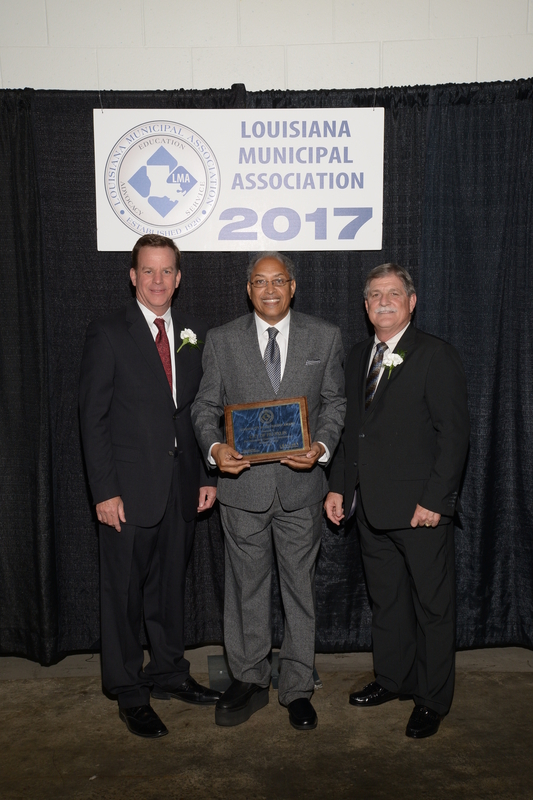 The City of Franklin, Louisiana received the Basic Services award for outstanding municipal improvements and accomplishments from the Louisiana Municipal Association (LMA) for their “21st Century Water Meters” program. Prior to the AMI implementation, Franklin’s water department was manually reading meters like many municipalities nationwide. This process is tedious, increases the potential for billing errors, and does not identify or provide customers leak information and usage patterns. The City partnered with Utility Metering Solutions (UMS) to design, implement, and fund their program from the ground up. First, UMS conducted a technology impact assessment to determine the financial and operational benefits the city could realize from implementing this program. Based on the findings, UMS designed a custom end-to-end program which included meter replacements, advanced metering infrastructure, data analytics and consumer engagement software, systems integration, and the updating of existing business processes. Improving customer service through the addition of a consumer-facing web portal which provides customers with access to usage information, alerts, and budget management tools. Identifying leaks before they become costly emergencies by providing consumption and location data to utility staff. Reducing unaccounted for water by upgrading aging water meters. Reducing operational expenses by enabling remote connects/disconnects, providing reliable data for right-sizing programs, and streamlining business processes. Promoting sustainability by reducing the frequency of truck rolls and empowering customers to reduce water usage. UMS congratulates the City of Franklin for receiving this prestigious award, and is privileged to have been part of this program. To see how UMS can build a custom program for your utility, contact us today.